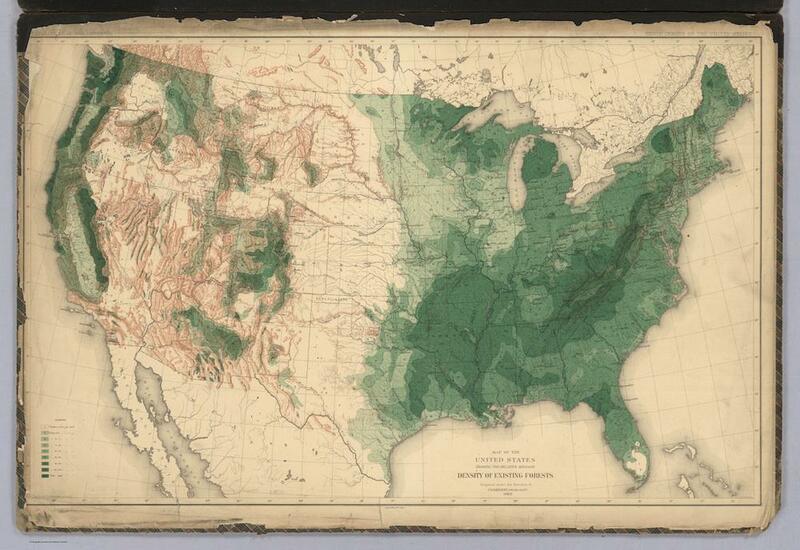 History of American Forests: Tree maps made for 1884 census. These tree maps, commissioned by the United States Census and published in 1884, were compiled at the direction of dendrologist and horticulturist Charles Sprague Sargent. The complete set of 16 maps, digitized by the David Rumsey Map Collection, represents American forests by genus of tree, density, and position. The USDA estimates that while the total area of forested land in the United States has diminished by 30 percent since the date of European settlement in 1630, “75 percent of net conversion to other uses occurred in the nineteenth century.” Sargent’s project was meant to capture the contours of the forest as it stood in the Victorian era. Sargent, a Bostonian and officer in the Union Army, was a professor of horticulture and the first director of the Arnold Arboretum at Harvard. As such, he was part of the first generation of professional American foresters; during his career, the Society of American Foresters, the U.S. Forest Service, and Yale’s School of Forestry and Environmental Studies were all founded. Historian Gordon G. Whitney writes that while census-takers collected data on the output of forest products per county beginning in 1840, Sargent’s report “contains some of the best information on the use and status of America’s forests in the nineteenth century.” Between the publication of Sargent’s report and the passage of the McSweeney-McNary Forest Research Act of 1928, which regularized the process of monitoring forest conditions, Sargent’s maps provided the basis for conservationists and politicians to wrangle over issues of preservation and planning. Scientists of the U.S. Forest Service produced a map of America’s woody biomass in 2012, using satellite data, computer modeling, and more traditional ground-based data. A rough comparison between this map and Sargent’s cordage density map (first below) reveals intriguing consistencies in pattern. Click on the images below to reach zoomable versions, or visit the collection’s page on the David Rumsey website. 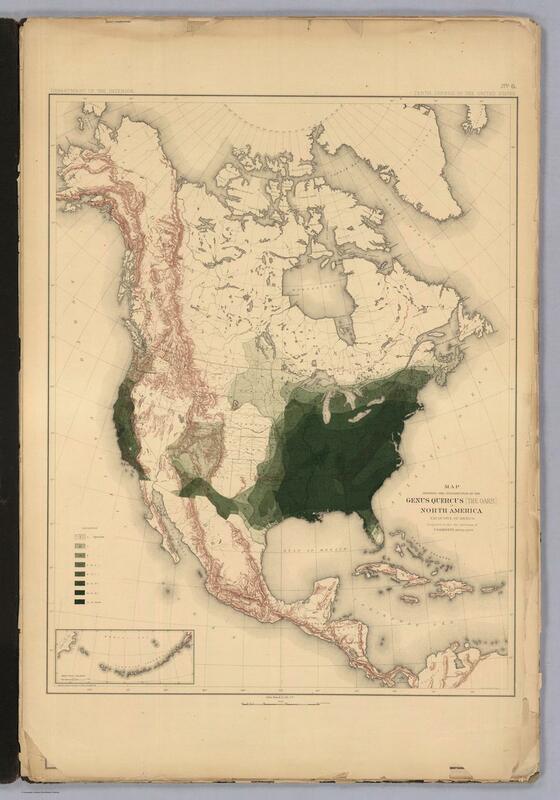 “United States, Showing the Relative Average Density of Existing Forests.” From Department of the Interior, Census Office, Sixteen Maps Accompanying Report On Forest Trees Of North America, By C.S. Sargent, 1884. 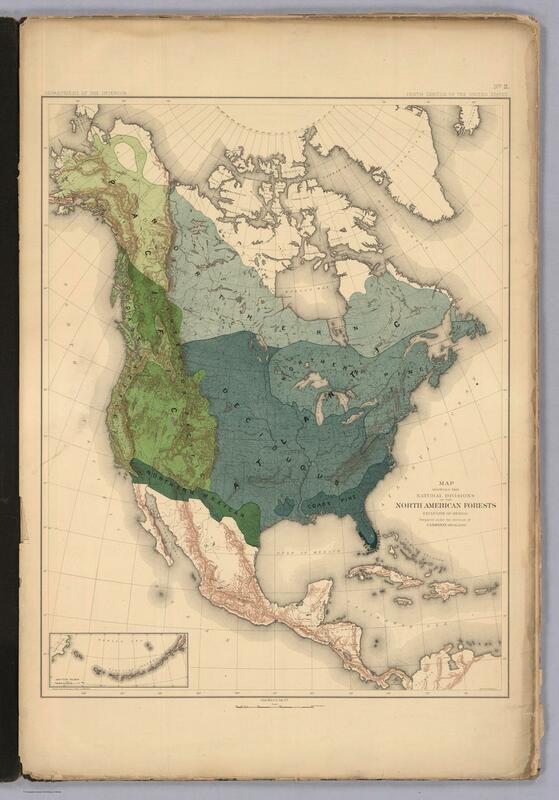 “Natural Divisions of the North American Forests.” From Department of the Interior, Census Office, Sixteen Maps Accompanying Report On Forest Trees Of North America, By C.S. Sargent, 1884. “Distribution of the Genus Quercus [The Oaks.] in North America.” From Department of the Interior, Census Office, Sixteen Maps Accompanying Report On Forest Trees Of North America, By C.S. Sargent, 1884. “Distribution of the Genus Pinus [The Pines.] 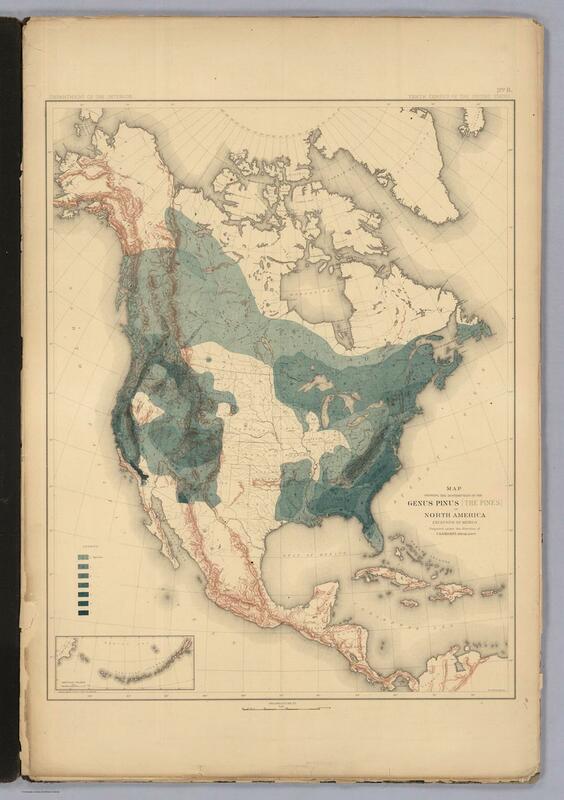 in North America.” From Department of the Interior, Census Office, Sixteen Maps Accompanying Report On Forest Trees Of North America, By C.S. Sargent, 1884. 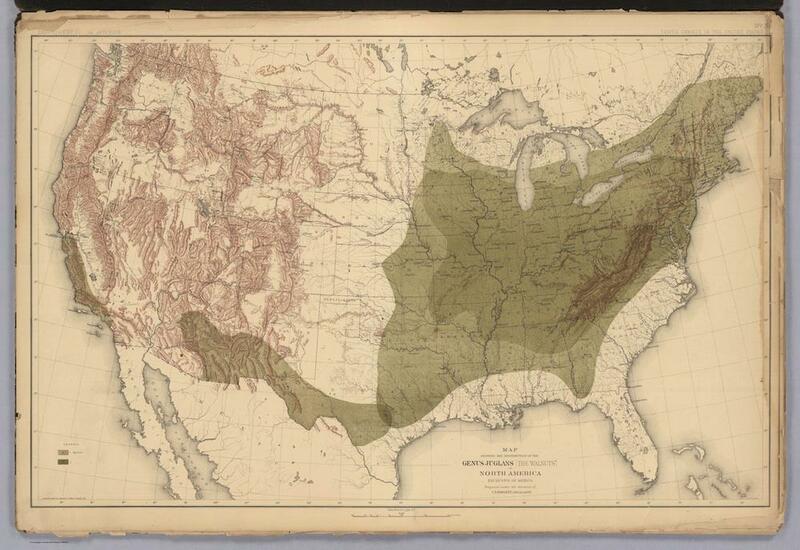 “Distribution of Genus Fraxinus [The Ashes] in North America.” From Department of the Interior, Census Office, Sixteen Maps Accompanying Report On Forest Trees Of North America, By C.S. Sargent, 1884. “Distribution of the Genus Juglans [The Walnuts.] 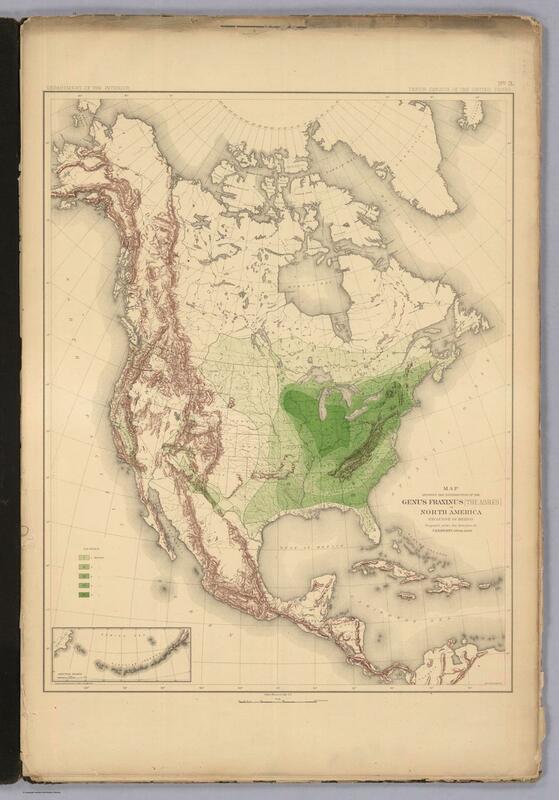 in North America.” From Department of the Interior, Census Office, Sixteen Maps Accompanying Report On Forest Trees Of North America, By C.S. Sargent, 1884.